When you find yourself creating the same design pattern over and over again, you may want to consider creating a custom element. Saved elements retain all the visual design as well as any logic being used in the saved sections. To create an element you first need to select what you want to be saved. This is often a single section or multiple sections. First select one part of the content you want saved. To save a range of elements you can hold down shift and click another element you want saved. This will highlight all the sections you have selected. In the example below you can see that multiple sections have been selected. Once you have everything selected that you want to save, you simply hit the save button on the lower right of the selected area. From there you will be asked to name your element (header, footer, 2 column products, etc...). This is the name it will be identified with on the elements tab. You will find the elements in the lowest section of the elements tab. You can drag them into the body of the email just like any other element. 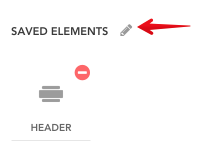 By clicking on pencil icon you can delete saved elements. When you save an element you may choose to replace an existing element.